I have to admit, the Men on a Mission calendar certainly challenges some of my perceptions regarding Mormon missionaries. I’ll bet it challenges the perceptions of the folks at the Church Administration Building, too. But an aspect of it seems like a worthy endeavor; the calendar will generate money for charities (a portion of the proceeds will be donated), and will put a fresh, lighthearted face on misperceived-as-stodgy Mormonism. These are things LDS Church leadership would certainly support. Update July 14, 2008: On July 13, 2008 Chad Hardy, creator of the calendar, appeared before a Church disciplinary council. After Mr. Hardy explained his vision and purpose for the Men on a Mission calendars, the Church council ”still felt the calendar is inappropriate and not the image that the church wants to have,” Mr. Hardy said. After 45 minutes of deliberation, the LDS Church council decided to excommunicate Mr. Hardy. 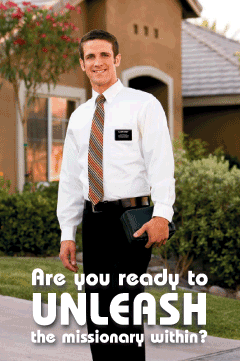 This entry was posted in Mormon Culture, Mormon Missionaries. Bookmark the permalink. Deu 32:9 For the LORD’S portion [is] his people; Jacob [is] the lot of his inheritance. No mention of gods. Plus gods is with a little (g) meaning Judge or even false god. In the Pearl it was speaking of other Gods meaning diety. Also About Psalms 82:1 Now the word gods there is the same word Eloihim translated gods, but it is also translated judges. In Exodus, chapter 22, verses 8 and 9, as God is giving instructions in the law for how the judges are to determine certain cases, and God calls the judges gods because a judge has such authority over a person’s destiny. And because he holds the power of a person’s life and destiny, God called judges gods. So, “God stands in the congregation of the mighty. He judges among the judges.” Or, God will be judging the judges. Here God is very clear Isa 43:10 Ye [are] my witnesses, saith the LORD, and my servant whom I have chosen: that ye may know and believe me, and understand that I [am] he: before me there was no God formed, neither shall there be after me. Thanks for the response. Did you read any of the sources I suggested to you before you responded? It would have helped you think through the issues, which is why I recommended them. First, your reading of Deut. 32.8 is based on a corrupted text; so it doesn’t really matter what your old KJV says (which is why scholars don’t use the KJV); the better text reads “gods” or perhaps more specifically “sons of god”–i.e., those of the divine council. YHWH’s portion is Israel; the other gods were appointed their own “nations”. Again, I recommend the scholarship I suggested earlier for a good start. Second, your reading of Ps. 82.1 runs counter to ALL current biblical scholarship, and your circumlocution around the clear meaning of the passage is clearly THEOLOGICALLY motivated. It avoids what the text ACTUALLY says (something you constantly accuse others of doing). The Hebrew word for judge is Shophet–not Elohim. Your reading is simply based on a mistranslation and/or a misunderstanding of the clear context. Mere human judges simply don’t stand in “the congregation of the mighty”, i.e. what is better rendered “THE DIVINE COUNCIL.” That this passage refers to the divine council and other real gods is admitted even by evangelical scholars, such as Mike Heiser, who I suggested for you to read (his articles cover both passages and are available for free on his website). Also, there is no capitalization in Hebrew. Whether something is capitalized in your English translation makes no difference. LDS Christians consider the Father the fount of divinity, and He, Jesus, and the Holy Spirit one God. They do not teach that other gods are to be worshiped. Are you honestly claiming otherwise? And your reading of the K.F.D. discourse is also based on a faulty underlying original text. I recommend Blake Ostler’s discussion of the text and its meaning in his 2nd Volume of Exploring Mormon Thought. Read those and then please get back to me. Best wishes. Oh, and since you think “gods” should strangely be rendered “judges” for some reason in the passage (again contrary to all current biblical scholarship in the academic community), should the passage in Isaiah perhaps be retranslated to say that before or after YHWH there is/are no other Judge(s)–i.e., Rulers/Judges of Israel or the Earth? Both words come from the same root El; Using your theologically motivated way of reading the text, it seems such a view could be posited. However, I think that such a way of reading texts is clearly incorrect. Thanks again and best wishes. So Mike, you want me to read LDS sources? Then assume they are correct and use the view of a false religion, Sorry, I dont think I will do that. Then you say the KJV is corrput, what version did you quote from? You never stated. I was under the Idea that LDS choose the KJV as the best out of all of them, that was why I used that one. Well, Rick B., if you are saying you simply agree to disagree then I guess the conversation is at an impasse. I quoted from the NRSV (New Revised Standard Version), a standard scholarly translation (however, I must admit to studying Hebrew and Greek; and I would recommend such study to anyone as to avoid translations except as reference works). I thought I put “NRSV” under my first quote from Genesis. I might also point out the English KJV isn’t used by the majority of the LDS Church, and the Church certainly sets no standards against consulting other translations or learning the original languages. You might want to keep that in mind. One other thing: Blake Ostler was the only LDS Christian source I mentioned you read (besides David Bokovoy’s conversation with Mike Heiser). However, to ever state that someone’s research is faulty because they are of a different faith or because in some instances they are wrong on some issues (and I don’t know what you are claiming Blake is wrong on, or what “Believers” here are taking issue with him) is hardly a reason to reject EVERYTHING they write. It should always be based on EVIDENCE. For instance, there are many scholars whose religious views (or lack thereof) I disagree with but whose writings I find quite insightful. I use research based on evidence. I would hope you do the same. I mean, do not all of us err in some ways? Should I reject everything you say simply because you have a different theological viewpoint and have human weaknesses as we all do? Or should I engage the evidence (as I believe I have clearly done)? And to find out what LDS Christians actually believe wouldn’t it be best to read what THEY actually have to say when they address the issues? Should I go to anti-evangelical sites to learn your beliefs? Thanks for the conversation. I will stop engaging this post with you now as you have said it boils down to us disagreeing. Mike, If you see this post, then while we disagree, Mormonism is a lie, founded by a false prophet, and Gal 1:8-9 clearly speaks to Mormonism. I stated before, Wolves in Sheeps Clothing, that is what Many LDS leaders and prophets are. I also pointed out how Jesus said, Many will say to me in that day, Lord Lord, yet they really do not know Him, and He does not know them. I wonder if you can differentiate between fact and opinion/belief. I admire your passion, but some of the things you say are unreasonable. Can you give me iron-clad PROOF that Jesus Christ died for your personal salvation? Probably not, because men are incapable of proving eternal truths because we are ridiculously minuscule in our intellectual capacity. This is why we have the holy spirit, to testify and enlighten… and why we need faith, to trust that His words are eternally true and His atonement can and will indeed save mankind from their sins. This is the litmus test for the restored gospel and its’ validity. Faith, not proof. “Proof” is by no means infallible because our conclusions are based on our understanding at the time we discover “facts”–we are limited by our mortal understandings. This is why God asks us to seek His word through earnest prayer (James 1:6), not proof-seeking—proof is for the temporal man…faith is the stuff of the eternities. Your questions have been addressed numerous times by both LDS Christians and numerous non-LDS scholars. The fact that you ask many of them shows you are not looking for sincere conversation or doing real research (for example, different ancient languages written with Egyptian script are well attested in the ancient world; including semitic languages [Hebrew is a semitic languages]. I am currently taking Middle Egyptian at school–can you even read Egyptian glyphs? What basis do you have to speak, other than you “think” ? ), but are attacking others and using scriptures as proof-texts to defend your personal beliefs/assumptions. I could claim the same of the scriptures you cite against evangelicals if I wanted to. For instance, NO current biblical scholars (including many evangelical scholars) in the academic community believe the NT reveals the creedal Trinity; or that the scriptures are inerrant. So I guess that means you teach a false gospel and are damned to hell according to your interpretation. In fact, there are NUMEROUS problems with the bible you seem completely unaware of. However, I won’t proof-text or take scriptures out of context as you do (as I have demonstrated with both Galatians and Psalms). I would rather deal with the issues and try and understand and learn as I go along, not just attack others by asserting my personal opinions. Your rhetoric is flagrant and hardly encourages others to converse intelligently with you. I would sincerely ask you tone it down. Finally, you hardly seem aware at all of current biblical studies. Have you read any of the basic material I recommended you? Maybe you should invest more time searching your own scriptures instead of trashing others personal beliefs that you can neither prove nor disprove. Can you show me there were no plates? Is absence of proof actually proof? Where is Jesus’ resurrected body right now? I’d like you to show me please. Amanda said I wonder if you can differentiate between fact and opinion/belief. I wish Mormons Could, BY taught Adam was God and our salvation hangs upon this, BY said it WAS SCRIPTURE/DOCTRINE, He did not say, this is my mere opinion. yet LDS speak for BY and say it was his opinion. Then Amanda said Faith, not proof. “Proof” is by no means infallible because our conclusions are based on our understanding at the time we discover “facts”–we are limited by our mortal understandings. So then You never read this from the Bible? As Christians we have the dead Sea Scrolls but no golden plates. I have heard Many Christians point out Evidence to support the Bible by way of Coins, bricks, Books, pottery and other vast evidence. Yet none if this has ever been found to support the BoM. Mike said I am currently taking Middle Egyptian at school–can you even read Egyptian glyphs? I say, Good for you, but that is not “REFORMED Egyptian And I have heard tons of People ask for evidence on this and none has ever been put forth. As to the Trinity, their is an entire topic covering that. Then you say, read books about the Bible, I would rather read the Bible alone, honestly how can you go wrong reading Gods word, verses reading Sinful fallen mans view on the Bible? You can quote all the scholars you want, that does not make them correct. Actually Rick B, I suggested not only that you read books about the bible by individuals who have advanced credentials and have spent their whole lives specializing in certain biblical topics, but that you also study/learn Greek and Hebrew as I have done, so that way you can actually dig into the material as close to its original form as possible. Have you done either? If you had you might not have said that the Dead Sea Scrolls are evidence to the “truth” of the bible as evangelicals understand it. For instance, the DSS in Deut. 32.8 reads gods (sons of god), i.e., members of the divine council, as opposed to your wrong old KJV reading. Does that prove your theology? Also, I guess I should reject everything you say since you are fallen and sinful (and have no credentials), instead of actually engaging evidence as I have done and you have avoided by your simple proof-texting and avoidance of real historical context. Thanks for the excuse. What evidence do you have of a large mass exodus from Egypt? That Joseph was really a leader in Pharaoh’s court? What ancient contemporary independent works say Abraham or any of the patriarchs ever existed? How do DSS from 100 BCE show that the books of the bible written hundreds of years earlier are “true”? Do you believe in all of the other books found with the DSS, like Enoch, or the Community Rule? Have you even ever read them? And where is Jesus’ body? You still haven’t shown me yet. Just because I can find Jerusalem on a map doesn’t mean you have proof that donkeys can really talk like in Num. 22.1-35. Please give me “proof” of that story. Please engage the evidence this time. Thanks, and best wishes again. Rick B. I will just send you think link via your blog if you are still interested; it was clearly up when I linked to it, so I don’t know how it was “unavailable.” What is your site and where should I post? Thanks. Mike said, And where is Jesus’ body? He rose from the dead, So I cannot go dig up a body. The Bible is Gods word and their is evidence to supprt enough of it so that even if I cannot support a mass exdous from Egypt, I still have enough evidence to support my believe, But in Mormonism their is zero Evidence. Still ZERO EVIDENCE of reformed Egyption. Yet if you use the Book of mormon as Evidence, you cannot find any trace of places through out history or anything. The Millions that Died in battle of Hill curmoh, I hear LDS now back peddling and saying maybe it was not in or around New york. Millions dead, I would think we could find a sword or coin or something, But we have nothing. I want evidence like this for the BoM. As to my blog, just click on my name, go into the profile section, you will find my email address. And the newest topic on this blog speak about many gods, have you read it, Maybe we could pick this up their, so more people following that topic can address these concerns from us. Here I suspect it is just you and me and maybe amanda. We aren’t “backpedalling” at all Rick. The limited geography model of the Book of Mormon was being embraced by LDS scholars LONG before most of the geographical and genetic challenges to the Book of Mormon were even being made. Besides, what do you care if LDS scholars want to make a more intelligent argument about the Book of Mormon? What does changing our position on the facts have to do with whether the Book of Mormon is a true record or not? How would you feel if you decided to change your position on the story of Noah to a more localized, rather than global, flood and I came along and started sneering at you for “backpedalling?” Would you feel that I had made a valid argument against your belief in the Bible? Sneering at Mormons simply because they have taken a more intelligent position makes it sound suspiciously like you are just bitter that we aren’t as easy a target anymore. This is not an honest approach to religious dialogue. Mike said (Paul used the Septuagint [LXX] predominately anyway, which is not the usual modern protestant bible.) Galatians is one of the earliest of Paul’s writings and of the NT as a whole (usually dated somewhere in the late 40’s or early-mid 50’s). The New Testament (or Hebrew Bible/Old Testament for that matter too) simply did not exist as a collected, canonized book at that time. you do not have a clue as to what you are talking about when it comes to the O.T. here. Here’s why, and from your own statement here too. time stating that the Hebrew O.T. did not exist at the time of Paul’s writing of Galatians around 50 A.D.
Paul’s writing of Galatians some 300 years later around 50 A.D.? Seth said Besides, what do you care if LDS scholars want to make a more intelligent argument about the Book of Mormon? That the book of Mormon took place somewhere in the Americas in an area limited to the size of perhaps present-day Alabama or smaller, and did not, in fact cover the entire North and South American continents. That is the modern scholarship’s position on the Book of Mormon. So your Cumorah problem is simply a non-issue. And your implication that this is something we simply made up in response to outside criticisms is unsupported as well. LDS scholars came up with this model for the Book of Mormon way back in the 60s and 70s. You are beating a long dead and buried horse here. Mormon leaders have clearly, authoritatively, and consistently taught that Hill Cumorah events happened in New York. This has been affirmed by people like Joseph Smith, Orson Pratt, Marion G. Romney, Anthony Ivins, B.H. Roberts, James Talmage, Joseph Fielding Smith, George Reynolds, and Bruce McConkie (cf. examples). It has been affirmed repeatedly from the General Conference pulpit, is currently affirmed in a current CES institute manual (CES Student Manual for the Book of Mormon, Religion 121 & 122, p. 136), and was as recently as 1990 affirmed in a letter from the Secretary to the First Presidency. So if it’s a dead horse, it’s one nonetheless branded with the fairly recent approval of the LDS Church’s Correlation Committee. The lay Mormons who show up for the church-run pageant in Palmyra, NY usually don’t have a clue what revisionists are cooking up in their apologetic ovens. They think the horse is alive. PS Word has it that an unpublished “revelation” of Joseph Smith concerning the final battles located at Palmyra will be in the Joseph Smith Papers project. But I’m waiting for conclusive evidence that this isn’t just a rumor. Would you please concede now? Are you simply willing to admit you “don’t have a clue” on this issue? I will wait for your answer. “….For me, this obvious insight goes back over forty years to the first class I took in the Book of Mormon at BYU….Here I was introduced to the idea that the Book of Mormon is not a history of all of the people who have lived on the continents of North and South America in all ages of the earth. Up to that time, I had assumed that it was. If that were the claim of the Book of Mormon, any piece of historical, archaeological, or linguistic evidence to the contrary would weigh in against the Book of Mormon, and those who rely exclusively on scholarship would have a promising position to argue. Also, historical studies of the development of a limited geographical model of the Book of Mormon from Joseph Smith’s time to the present are easily accessable from numerous places. From the way you presented yourself in your post, I have to ask if you have ever even seen or read any? Historical views on this subject are certainly less static than you let on. Also, your rhetoric seems calculated to inflame and alienanate LDS commentors. Am I misreading you? If so, I apologize; otherwise could you tone your rhetoric down please? I’d say Aaron’s rhetoric is designed to provoke, but not necessarily to alienate. Since the point of blogs is to provoke, I’m not all that concerned. When Joseph Smith said that God commanded someone to go preach to the Lamanites, I don’t think he was using the modern revisionist framework. I don’t accept the “it-doesn’t-really-explain-the-origin-of-the-Native-Americans” reading of the Book of Mormon, largely because I read it within the context of the 19th century and the beginnings of Mormonism. Because I believe (for good reasons, indeed) that the Book of Mormon is fiction, I’m far less likely to take an internal look at the text as seriously as a look at how the text corresponds to the context of Joseph Smith’s day and how Mormonism has traditionally interacted with it. That said, it must be said that I don’t think the LGT accounts for all the fatal anachronisms found internally within the Book of Mormon, even though it might better account for internal demographics and travel times. And no, I don’t think the weight of what I wrote regarding the traditional geography model for the BofM / Hill Cumorah is negated by the comment of one recent Mormon apostle. In fact, it just exasperates the bigger point: It has been well established that traditional Mormon teachings—even those considered highly authoritative from those that are supposed to be the Lord’s mouth pieces—can be abandoned with the shrug of the shoulder. I don’t interact with FARMS or FAIR like it represents normal Mormonism. It’s a far different kind of Mormonism than the one you’ll find at the lay level. On this issue, Oaks is just one of many LDS leaders who will in the future openly admit the need for the LGT, but he is hardly representative of the weight of traditional and currently mainstream beliefs within the Mormon church. Mike, if your idea of respect is cold academic irenicism without polemics and harsh assessments, this is not the place for you. I’d give you two reasons why we encompass more literary devices and tones: The Bible does, and normal, effective, human discourse does. We are geared toward the common people. Indeed, provocative rhetoric often helps accentuate substantive content for common folk. And that means that such rhetoric can, in the larger scheme of things, be loving. That said, I wouldn’t want you to, in the long run, lose sight of the fact that I pray for you and want you to come to the truth. Personally, I think that Joseph Smith was simply wrong on this score. You seem to expect an unreasonable degree of infallibility from a prophet. But I allow for Joseph to have been simply wrong on various occasions. It is perfectly harmonious with my view that God simply did not instruct Joseph Smith on how to think about every last little issue he expounded upon. It is entirely possible that God did not find it necessary to correct Joseph Smith on his speculations regarding the Lamanites. And why should God correct Joseph on this point anyway? It led to a very admirable spirit of outreach to the beleaguered Native American tribes. What’s the harm in that? It’s nothing compared to what evangelicals seem to expect of their own prophets, and of anyone claiming to be a prophet. Seth, are you aware that I was speaking of something repeated in your own scriptures? One example would be D&C 28. Are evangelicals unfairly expecting the infallibility of the D&C? The whole thing could be referencing a traditional sort of concept of “lineage” rather than a modern DNA-supported one. If an Amerindian had ANY ancestry, no matter how remote, and no matter how genetically untraceable, he certainly would have qualified as a descendant of the “Lamanites” to Joseph Smith’s 19th century thinking. Similar to the common Mormon conception that Israelite lineage has made its way into the bloodlines of every last individual on the face of the planet. Such a connection need not be provable with today’s science to be valid. Or it’s possible that I’m full of it. Take your pick. Seth, that seems like a stretch, and it is hardly the kind of elastic thinking one can reasonably assume original readers of D&C 28 did. There was a particular, significant ancestry people assumed the “Lamanites” had, especially with the last battles of the Book of Mormon in mind. There were supposed to be the only ones left. That’s why they assumed all the Native Americans were Lamanites. If you think that because I might be wrong on this issue then that makes me wrong on everything or makes mormonism true, you better think again. I admit I have been wrong before and will be wrong again. Take Undeterred for example. I quoted YOUR PROPHETS talking about how Christiens beliefes were hacthed on the boarder of hell. Jeff B mention them again, Undeterred Accused Jeff of mis-quoting them and trying to tell us what those verse really ment. I pointed out how I own the Entire set of JoD, and ask for spefic pages and how they were taken out of context. Undeterred has since left the building and has not replied again. Rick B could be wrong, an LDS was wrong, whats your point? On my blog I posted a link here before how LDS prophets/teaches, and presidents cannot agree, I showed 4 of them not agreeing, If I cannot trust them to know the truth, how can I trust you to be correct, if you Listen to them? The the Mormon Blake was so off on something a topic on this blog was done about him, Yet another LDS who has no clue, Yet it is a big deal that I might not. The introduction to the Book of Mormon is not the same thing to me as the text of the Book of Mormon itself. Aaron, if you want to make the point that most LDS believe all this stuff, I’m not arguing with you. You might well be right. I’m just saying my position is different and there is an alternative view of things out there. If you want to critique the views of lay Mormons, fine. But be sure you specify that this is what you are doing. Don’t think that simply attacking what most lay Mormons believe automatically casts doubt upon the whole enterprise. Am I to conclude that because stict creationism is utterly without evidence, and actually seems kind of silly, and yet is believed by an awful lot of Christians, that Christianity itself is a “ridiculous” religion? I know a lot of atheists who seem to think so. It’s nice that certain Church leaders and lay members drew conclusions from the limited scripture out there that they felt were reasonable. I do not share all those conclusions. Having a prophet has never been an excuse for turning off your brain, and it is incumbent upon everyone to study out things for himself and determine what they can and cannot sustain. I realize this makes the world less certain – less black and white. Tough beans. Somehow I think you can learn to live with a bit of healthy uncertainty in your life. The Mormon faith has precious little doctrinal tests for whether you can or cannot be a believing member. Most of its tests deal with right conduct – a far more relevant measure of one’s membership than the doctrinal tests other Christians seem to be so fond of. Seth Said Aaron, if you want to make the point that most LDS believe all this stuff, I’m not arguing with you. You might well be right. I’m just saying my position is different and there is an alternative view of things out there. I dont know Seth, but it seems your implying you might be wrong here, and you have stated before that even LDS cannot agree among themselves. What are your thoughts on this verse here. 6 It is impossible for a man to be saved in ignorance. Saved in ignorance of what Rick? Keep in mind that evangelicals have an advantage here in that all their prophets are comfortably and tidily dead and have been for thousands of years. That’s plenty of time to filter their original messages and jettison that which was not worth keeping and enshrine that which was worth keeping. Having current, living prophets is a much more messy business. You ever read about the squabbles between Christ’s own original Apostles and the Apostle Paul over the requirement of circumcision, or whether Paul should even be considered an apostle in the first place? You think the scribes and caretakers of the Mosaic law were thrilled about Jeremiah and Isaiah coming onto the scene, challenging the status quo and demolishing their careful interpretations and legal justifications under the Law? Watching prophesy being made is like watching sausage being made. It’s not for the squeamish or those who are offended by untidiness. Seth, You can tell me all you want about the apostles not agreeing, But as to the verse about Not being saved in ignorance is something YOUR PROPHET said, not the Bible, not God, not the Christian Church. If your ignorant on this issue then I guess you cannot be saved. The other problem is, your Prophet and reading the entire text for context does nothing, it looks as if that verse was just randomly put in their. Please do not throw up smoke to avoid the issue, if you cannot answer it, fine, simply say, I dont know and sadly I am ignorant on this issue. The problem is, you are coming from an evangelical assumption that this life is all there is. You get one shot, and then you are done. Mormonism assumes no such thing. We believe that those who have no opportunity to accept Christ in this life, will be given the opportunity to accept it in the next life. In Mormonism, there is a spirit world that precedes our final judgment and final destinations of the Celestial, Terrestrial, or Telestial glories. After we die, we all enter this spirit world of waiting for the final judgment to come. For the righteous (of any nationality or denomination) this is a happy time of anticipation, waiting and ministering unto their fellow spirits. For the unrighteous, it is a time of anxiety and fear of the impending judgment. All will have every opportunity to come unto Christ and lay hold of that glory and knowledge that they require for salvation. That said, Mormonism has a heavy emphasis on acquiring all the information we can while we live in mortality. It is a common Mormon teaching that you cannot simply slack off today saying “oh God will work it out somehow in the afterlife.” We teach that the same spirit or inclination that possesses a person during mortality will also possess them in the afterlife. Thus the Mormon emphasis on education and seeking out after truth, from ANY source. Seth said Does this answer your question? Simply put, NO. The reason why is, You say All will have every opportunity to come unto Christ and lay hold of that glory and knowledge that they require for salvation. But the D and C teaches other wise. First it teaches you cannot be saved in ignorance, so what if you do all you can and listen to your prophet, if your still ignorant of the Teachings how can you be saved? Then Bruce Mc said, anything less than Exaltaion is damnation. Not damnation as in eternal hell like I believe, but it is not the highest heaven. All have an equal opportunity to gain the knowledge they need for salvation whether in this life or the next. Incidentally, people are given the chance to marry as well after this life. Sad how LDS contrdict what the LDS scripture teach. First off, it say you cannot be saved in ignorance, but you claim you can be saved in the next life. Who is correct and why should I trust you? Then you teach People can be married in the Next life, again D and C is clear, it is NOW Not later, yet you claim it can be later. If your Scripture teaches one way, and you or other LDS do not agree, you simply claim in a round about way, that the scripture is incorrect.